I may, or may not (probably not) have an obsession with mini erasers from the Target Dollar Spot. I can't stop buying them. To the point where I was so excited to score some penguins and snowmen on clearance for $0.30 a pack even though I already have slightly different penguins and snowmen at home. Seriously!? Who needs all these erasers? Me and any other elementary teacher or parent, that's who. Usually I do my Target shopping alone or with my kids but there were 2 times during Christmas break where my husband was with me. As I am digging through the Dollar Spot looking for more erasers and disappointed that I can't find the newest ones that I know are out there, my husband asks what I am going to do with all the erasers in our cart. I quickly add I can probably come up with ten different ways to use them for learning right now off the top of my head. And voila, this blog post was born. Here are 10 (plus a bonus) ways to use mini erasers for learning in the classroom, home, homeschool setting, etc. In my classroom, I used estimation in two different ways. We would have an estimation jar that I would change out weekly with different objects and a different amount each time. We practiced different strategies for estimating an unknown number. My students would make a guess at how many items were in the jar and on Fridays we would count the total together. Seasonal erasers would make perfect estimation jars for each holiday. Another way that I liked to used estimation was at a math center. This would be similar to our class estimation jar but I would make smaller quantities and put them in little bags so that each student at the center could practice estimating and then counting. The above estimation page is from my Count It, Sort It, Graph It math center. A great way to use mini erasers is to sort them. Sorting is an activity that even toddlers can do. My 3 year old was working on sorting by size and by color this week. Older students could pick their own way to sort based on the erasers you give them - size, color, shape, features, etc. The above sorting page is from my Count It, Sort It, Graph It math center. Use a handful of mini erasers to create a graph - bar graph, pictograph, line graph. It doesn't matter what type you are working on, all of those graphs would work with these erasers. Once students sort them and then count them, they can graph how many of each kind they have. The above graphing page is from my Count It, Sort It, Graph It math center. Mini erasers make great game pieces. If you have more than one person playing a game, just give them each a different type of eraser. Checkers, bump, board games...the sky's the limit. Patterning is an activity my daughters loved, but so did my second graders (obviously with more complex patterns). Work on growing, shrinking and repeating patterns by using different erasers. So easy yet it is perfect for those tactile learners. Are your students working on their letters? Give them some erasers and have them form the letter. Need a sight word station? Give them erasers and let them spell the word out of these cute shapes. They work the same with making numbers, number sentences, and more. Sometimes you just need a little incentive to help your students stay on track. When the class is having great behavior, add an eraser to the jar. When the jar is full (or you reach an amount that you've all agreed upon), celebrate with a fun reward - extra recess, game afternoon, pajama day, movie, etc. Have you tried these STEM Bins by Teach Outside of the Box? They are so much fun. The idea is you make different boxes with simple materials commonly found in the classroom. These are paired with cards with pictures of different objects (building, tower, house, tent, trap, etc.) and the students have to use the materials to make the object. Throw some erasers into a STEM bin and challenge your engineers in training to design and create. These erasers are ideal for manipulatives for math activities - counting, addition, subtraction, multiplication, division, etc. Let your learners be able to move and manipulate the erasers as they try to understand the math concept. Have students grab a few erasers and make a story based on them. The erasers could be characters in the story or objects that are important to the story line. And here is a bonus use for these erasers.....to actually erase with them. Haha! You know for when those pencils are still long and sharp yet the erasers is gone (used, chewed, who knows?) Hand out these cute erasers to have students use instead of throwing away the pencil. This is just 5 of the sets that Amazon has. 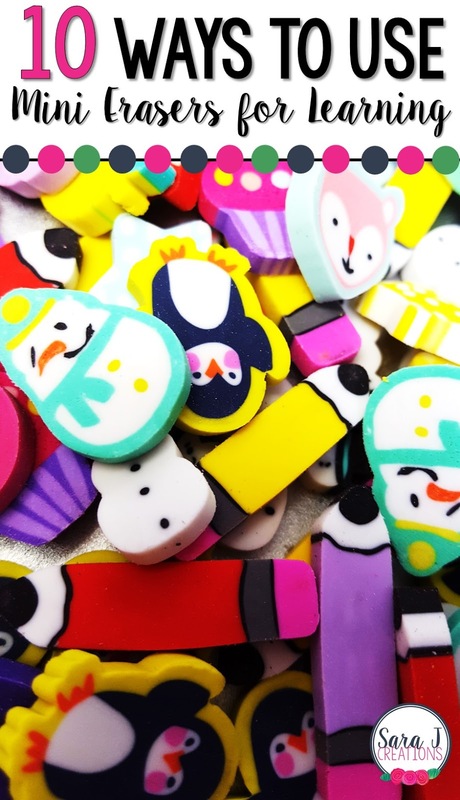 There are so many more, so you can still collect all different erasers for each season or unit of study. Now, take those erasers and do something! Don't just hoard them and store them because they look cute. Use them in your classroom or in a homeschool setting with your kids. These are only 10 ways to use them - how many other ways could you add to this list? I pushed a jewelry head pin through the top of some Christmas erasers, looped some ribbon through the hole and made inexpensive Christmas ornaments for my class tree. Oh that's a super cute idea!! Use snowmen or pencils (any of them really) for non-standard measurement.